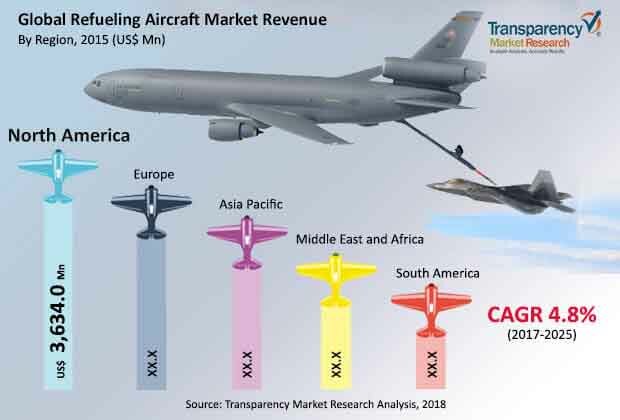 As the aviation industry continues to touch new peaks each year, the global refueling aircraft market is flourishing and an increasing number of players are making a foray into it, according to the findings of a recent business intelligence publication by Transparency Market Research (TMR). That being said, the analysts of the TMR report have notified that the competitive landscape of the global refueling aircraft market is largely consolidated among a small pool of players who have established themselves in the past decades. The report identifies Lockheed Martin, General Electric Aviation systems, Eaton Corporation, Cobham Plc., Refuel International, Fluid Transfer International, Marshal Aerospace & Defense Group, and Garsite LLC as some of the prominent players who are currently ahead of the curve in the global refueling aircraft market. If the estimations of the TMR report are to be believed, the demand in the global refueling aircraft market will expand at a notable CAGR of 4.8% during the forecast period of 2017 to 2025. The report has projected that the opportunities in this market will translate into a revenue of US$12,868.7 mn by the end of 2025, substantially up from its evaluated worth of US$8,146.0 mn in 2015. In the near future too, the analysts are foreseeing the shares to remain reserved predominantly among the market leaders, who are constantly indulging into collaborations and strategic acquisition with their financial might. The aforementioned players also have a strong product portfolio to cater to diverse demands. For instance, Lockheed Martin’s KC-130J tanker is among the leaders in aerial refueling for tactical and tiltrotor aircraft and helicopters. KC-130J tanker is also capable of conducting rapid ground refueling operations for tactical or armor vehicles. Such advanced aircraft refueling systems are designed to incorporate additional safety features and possess high flow rate at a lower price. AFS Aviation Fuel Services GmbH, Titan Aviation, and OMEGA Air Refueling have been identified as some of the other key players holding a mentionable position in this market. On the basis of component, the TMR report segments the refueling aircraft market into aviation refueller including 7,000 to 25,000 liter and 25,001 to 50,000 liter, dispenser including mini hydrant and hydrant, refueling pods, probe and drogue, and others. Based on refueling medium, the market has been bifurcated into air to air refueling including probe and drogue method and flying boom method, and tanking method. On the basis of aircraft type, the market has been classified into commercial airplane, helicopters, and military airplane, which has been further sub-segmented into combat and non-combat. Geographically, North America has been highlighted as the most lucrative region, estimated to provide for a demand worth of US$5,529.3 mn by 2025. Aviation fuel is highly inflammable and besides posing strong safety concerns, it is harmful to the natural ecosystem of the soil as well. Consequently, apart from increasing pressure on the aviation industry to cater to the expanding demand, growing concerns regarding the incidences of oil spills as a result of to a faulty refueling equipment is driving the global refueling aircraft market. In addition to that, continuous advancements in air to air refueling technique is expected to reflect positively over the market. This technique enables heavy aircrafts to take off with minimal payload and gain fuel when a cruising altitude is attained, which results in significant savings on fuel expenditure for the carriers. International standard regulations for the aviation industry, such as International Civil Aviation Organization (ICAO), Civil Aviation Authority (CAA), Joint Aviation Authorities (JAA), Federal Aviation Administration (FAA), European Aviation Safety Agency (EASA), International Air Transport Association, is another factor augmenting the demand in the global refueling aircraft market. The demand in the global refueling aircraft market will increment profitably at a CAGR of 4.8% until 2025. The competitive landscape to remain largely consolidated among a few players. International aviation safety guidelines providing strong traction to the market for refueling aircraft.